Florida man bitten on tongue by rattlesnake! You cannot make this stuff up!! 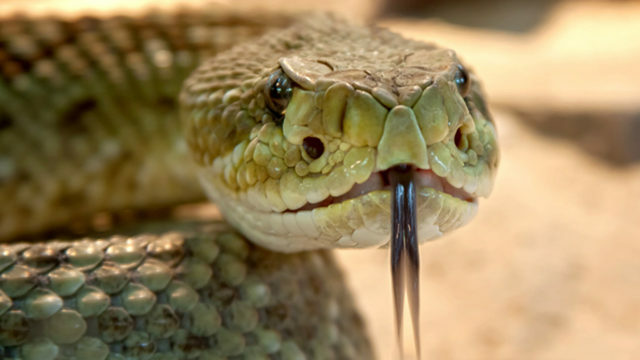 A man was taken to the hospital after he was bitten on the tongue by a rattlesnake in Putnam County on Tuesday. A helicopter took the man to the hospital after he was bitten at Airport Estates Road and Clark Road in Bostwick. He is in critical condition, according to Putnam County Fire Rescue. Re: Florida man bitten on tongue by rattlesnake! that could make the short list for Ripley's Believe It or Not. The potential complications are nearly endless. Prayers sent. !!! IM THE REAL NIGHT RIDER B!TCH !!! !!! AND A PROUD TO BE IN THE DIAMONDBACK FAMILY !!!! Florida man is recovering in hospital after reportedly being bitten on the tongue by a rattlesnake he was trying to kiss. Ron Reinold was playing with the snake, which had been captured the previous day by a neighbour, when he attempted to kiss it and was bitten, a local CBS channel reported. Reinold, who was flown to hospital by helicopter in a critical condition, is recovering and expected to survive, according to his family. Charles Goff, from Putnam County, told Action News Jax that he found the reptile on Monday and put it in a tank as he was not sure how to handle it. "The next morning before I got up, they were playing with the snake," Mr Goff told the local network. "One boy said, 'I'm going to kiss it in the mouth,' and the snake bit him in the face." Mr Goff said Mr Reinold and another man were being irresponsible by playing with the snake. "Ron was just acting silly, you know?" he said. "I guess he said he could kiss the devil and get away with it, but evidently he didn't." The snake is believe to have escaped. Both of these cats must share a common genetic abnormality. I guess it"s like the old saying:"IGNORANCE CAN BE CURED....STUPID IS FOREVER"